Taco Catering North Platte: Show Your Employees Your Appreciation! 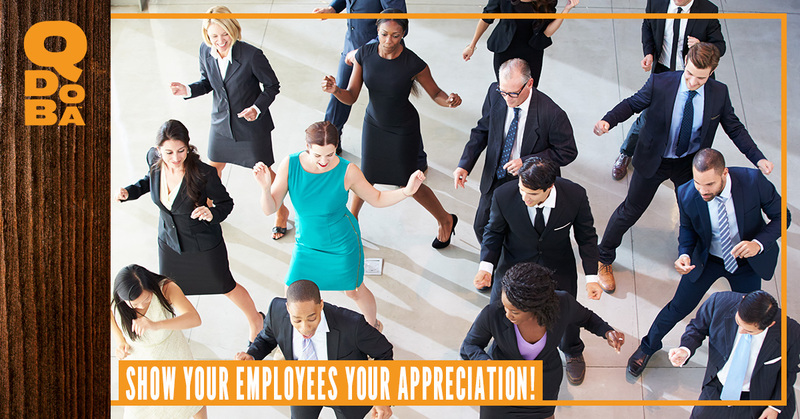 Show Your Employees Your Appreciation! Break out the petty cash box and treat your employees to a catered lunch from Qdoba. We offer the finest Mexican eats, and we serve Cheyenne, Laramie, and North Platte, though some locations will involve a delivery fee. We know that it takes more than the best Hot Taco or Hot Naked Burrito Bar to really let your employees know you appreciate all their hard work. Here are some more ideas to let them feel the love. Announce that your whole team can enjoy a lie-in and come in to work an hour or two late on a designated day. If you can do this on a Monday after a holiday, they’ll thank you! Pick the next three day weekend, and let everyone go home an hour or two early. It’s these intangible acts that employees will remember when they are deciding if they want to look for a new job or not. Everyone likes to be recognized for simple things, but in a workplace, going the extra mile can go unnoticed. Write out “You’re Awesome” tickets, and write someone up when you see them doing something that makes you happy they work there. If you know that one of your employees has an amazing talent, and most people do, spotlight them and their talent on your Facebook page. Your employees will love it, and it will engage your customers. Enjoy the people you work with, and treat them to a catered Qdoba catered lunch and to them know they are more than just a number. Call your North Platte taco catering team today!